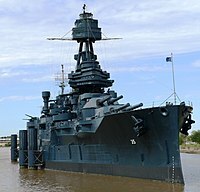 This is a list of official U.S. state ships. ↑ "California State Library - History and Culture - State Symbols - State Tall Ship". California State Library. 2007. Retrieved 2010-11-17. ↑ "CT.gov: The State Ship". August 5, 2002. Retrieved 2010-11-17. ↑ 3.0 3.1 "SOTS: Sites, Seals & Symbols". Secretary of the State of Connecticut. March 23, 2010. Archived from the original on 2012-02-12. Retrieved 2010-11-17. ↑ "CIS: State Symbols". Massachusetts Secretary of the Commonwealth. Archived from the original on 2007-07-31. Retrieved 2010-11-17. ↑ "Skipjack, Maryland State Boat". Maryland State Archives. Archived from the original on 2007-07-31. Retrieved 2010-11-16. ↑ "Title 1, §218: State vessel". Maine Legislature. 1987. Archived from the original on 2012-07-31. Retrieved 2010-11-17. ↑ "A.J. Meerwald - NJ's Official Tall Ship". Retrieved 2010-11-17. ↑ "P.L.1998, c.009 (A750)". New Jersey Legislature. April 21, 1998. Retrieved 2010-11-17. ↑ "GS_145-11". North Carolina General Assembly. Retrieved 2010-11-16. ↑ "Boat, Shad Boat - NCpedia". State Library of North Carolina. Retrieved 2010-11-16. ↑ "The Pennsylvania General Assembly: House Bill 1071". Pennsylvania General Assembly. Retrieved 2010-11-16. ↑ 13.0 13.1 "Rhode Island state symbols". netstate.com. Retrieved 1 January 2011. ↑ "State Symbols". RI.gov. Retrieved 6 October 2012. ↑ 15.0 15.1 "State Symbols - Texas State Library". Texas State Library and Archives Commission. Archived from the original on 2007-07-31. Retrieved 2010-11-17. ↑ "Symbols of Washington State". Washington State Legislature. Archived from the original on 2011-11-29. Retrieved 2010-11-16.